The contemporary artist Sanzi is a professional artist who gain a great success in art business, and also a world beyond literati who detachment from life. It is about half a year ago when I first saw Sanzi’s works.With the suggestion from a friend of mine, I went to Sanzi’s art space at M50 which is just near the Suzhou river.I saw the great momentum which is also very transcendent and felt suddenly enlightened when first sight of his works.The transcendent and Daoist artistic conception in his works is aimed at express the the nature of universe and the metabolism of everything. 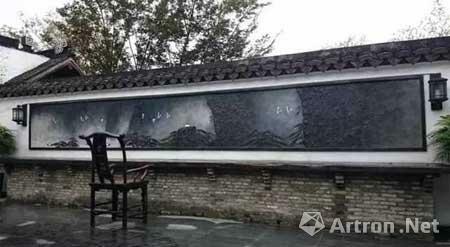 Sanzi present the Chinese traditional Daoist philosophical thinking on the canvas in the way of representational art form which has a strong visual impact and artistic appeal.Days ago, the Sanzi Garden at Qiandeng village Jiangsu was completed and this garden is designed and built by himself. At the completion ceremony, the journalist from ShangHai Securities News has a deep conversation with Mr. Sanzi. There is light rain the day completion ceremony was held. Guests walk in the Sanzi Garden with the melody of a singer.The garden is not too large but there are all kinds of trees and Chinese traditional architectures. The bricks，tiles ,windows and doors are all have a long history. Those are all Mr. Sanzi’s precious collection. He found and bought them from all over the country. Almost every detail of the garden express Sanzi’s esteem to the Chinese traditional culture and his humanistic feeling.It cost about 5 years to finish the garden from concepetion，design to build according to what he said. It is his largest work and take the longest. This ceremony also contains another important section----The celebration of Mr. Sanzi signed with Huajinghuihe Company.Huajinghuihe Company is a lager company which contains investment and financing both in the traditional field and art. They also deeply cooperate with the famous international art organizations and are aimed at attracting the best art institutions and artists from other countries. This company also signed with Mr. Zhan Jianjun(Professor and Doctoral tutor of central academy of fine arts，Chairman of China Oil Painting Society, vice Chairman of China Artists Association) not long ago. Sanzi is the second famous artist signed with this company. Sanzi has already signed with other two art organizations before: the Taglialatella Galleries from New York and the OVAS & Art Weme Galleries from Singapore and Malaysia. The Taglialatella Galleries is the agency of Mr. Sanzi at USA and Europe. And the OVAS and Art Weme Galleries is his agency at Asia.The Taglialatella Galleries is a very famous gallery sharing highest reputation in New York which has a history of more than 40 years. The gallery has already signed with Andy Warhol, Jeff Koons and Andrew Wyeth and also cooperate with Picasso in early time.And Sanzi is the only Chinese artist who signed with them. ”Dom, the boss of the gallery, loves Chinese traditional culture very much. And the theme of my works are from the Daoism. That is the most traditional philosophical theory of China. I think that is why he want to cooperate with me.” Said Sanzi. 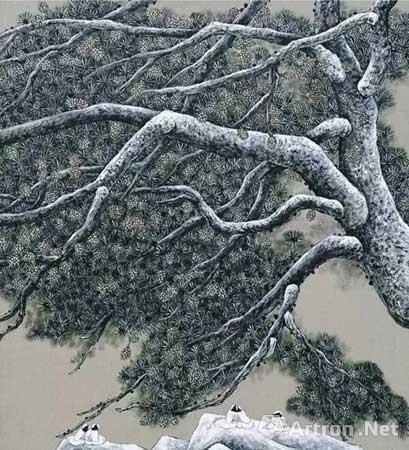 After reviewing the Chinese contemporary art market in these years，we can find that there are a large number of works which make culture and philosophy as their theme. But hardly can they express the Chinese traditional philosophical thinking actually. Most of these works are just designed to cater to the aesthetic needs of market and buyer. 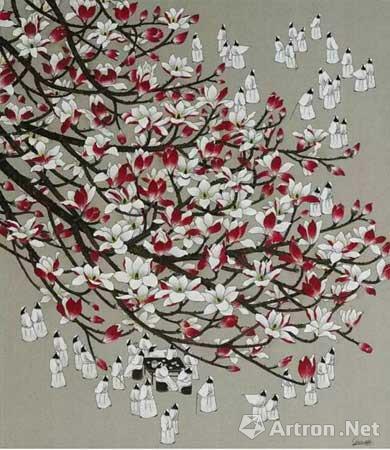 Sanzi deeply understand the the essence of Taoist Philosophy and express the abstract philosophy on the artistic works. It is inseparable with his rough childhood experience and rich life experience.He think that a true artist should be based on three points: firstly, solid basic skill; secondly, profound culture background and thirdly, a wealth of life experience. These are the source inspiration. Sanzi said he was from Yangzhou Jiangsu province. His ancestors were famous capitalists in local. His parents migrated to Hongkong in early years and then back to the mainland in the early 50's of last century. After a few years, his parents were designated as the right and was forced to go to the countryside for labor transformation. Mr. Sanzi was just born then. He was an only child and shortly after his second birthday, his father died. The mother with the young Sanzi had to live in a very miserable and adrift way. And that’s why he change his name to “Sanzi”(Sanzi means adrift in Chinese) to make a living away from home. When the culture revelation was finished, his family was vindicated. His mother was arranged to work in a local bank in Hunan as a compensation. When he grow up, he also got the chance to work in the bank. The path of his life should have no association with an artist. However, the fate is so fantastical. According to his memory, he had a neighbor who has great talent for painting but with mental disease. He always painted a lot in the farm land or on the neighbors’walls. “It’s a big please for me to watch and learn his paintings. It maybe unconscious but inadvertently buried a seeds of art in my heart.” Said Sanzi. While working in the bank, his love for art increase strongly.Finally he made up his mind to quit his job at the bank and took the college entrance examination. 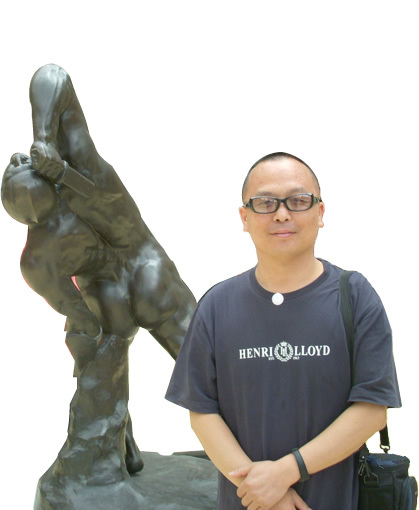 He successfully admitted to the Department of process modeling and design of Hunan Arts and Crafts Vocational College, began a formal and systematic study and creation.3 years later,Sanzi entered the Department of oil painting, Academy of Fine Arts, Hunan Normal University.Sanzi said that although his was more interested in oil painting, but he benefited a lot from learning process modeling design.And the competition of Sanzi Garden many years later is due to a solid foundation when he studied at Hunan Academy of fine arts and technology design department. After graduated from the college, Sanzi go travelling and living at many cities. He tried many art related work, but most of them are not successful.Facing the nadir of career and life, he calm down and began to seriously think about the value and meaning of life, also began to gradually realize the essence of Lao Zi and Zhuang Zi's philosophy.Thinking about the outlook on life and the universe, he was in a subtle influence , the style of his works began to change, and Taoist philosophy began to gradually integrate into his works. My style of works is actually mature in the past 8, 7 year. Before that, I have tried on rice papers in the way of Chinese ink painting. While living in America for several years, I was inspired a lot and learnt more about the Daoist philosophy. For example, the figures in my works are all very small, because I want to tell people that we are also tiny when in contrast with the earth, the solar system and the universe. As Lao Tzu see the world and individual in the view of the universe. 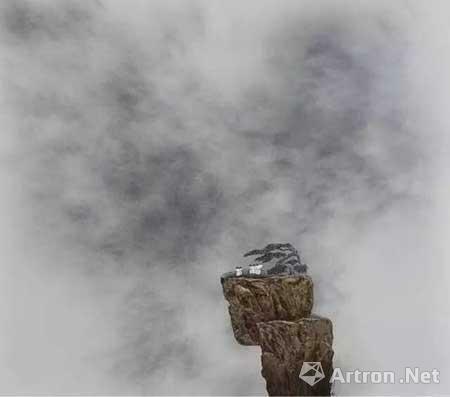 That is more intuitive to reflect the relationship between man and nature.” Said Sanzi. Nowadays，after signed with the agent Huajinhuihe Company, a series of promote plans are put on the agenda. He said that except taking part in the Taipei Art Fair, Singapore Art Fair , Malaysia Art Fair and Basel Art Fair in Miami, they will also hold a series of travelling exhibitions at China. Besides, about the art creation, Sanzi said that he is trying a new form of creation which include the new theme, skill and media. Among them, the present of female living condition by Taoist thought may become a new exploration direction.